Spinal Trauma (Traumatic Fractures) - Matthew D. Hepler, M.D. Injuries involving the spine represent a relatively small percentage of the overall number of acute musculoskeletal injuries but have a disproportionate impact on patient impairment, economic cost, and societal burden. These injuries encompass a wide spectrum from devastating high energy spinal cord injuries (SCI) in younger patients to more benign low energy osteoporotic compression fractures (VCF) in the elderly. Yet, even 40% of patients with VCF go on to develop chronic disabling pain and deformity while traumatic fractures often require complex spinal reconstruction(1). For these reasons we have included a focused evaluation of spinal fractures in the deformity chapter including (both high and low energy fractures) although these injuries are discussed in part in Chapters 5 and 6, Osteoporosis and Musculoskeletal Injuries respectively. This data is derived from the various databases using spinal cord injury codes and osteoporotic spine fracture codes. 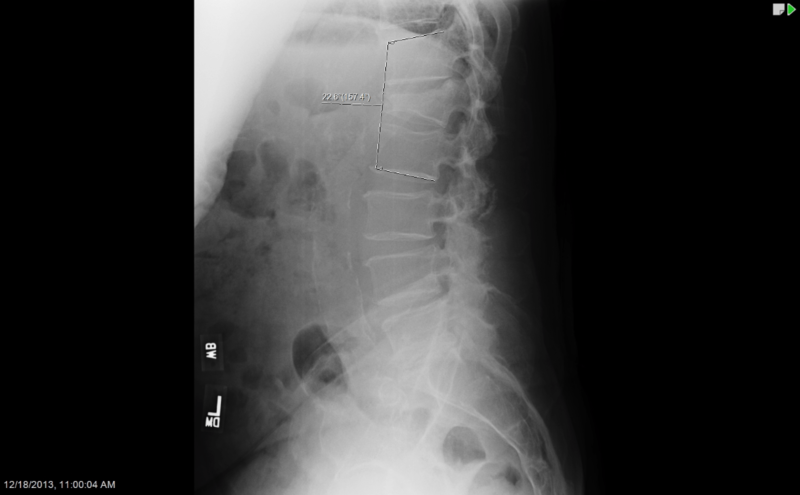 Figure 1 L1 osteoporotic fracture with 22 degrees of focal kyphosis. Vertebral compression fractures (VCF) are low energy injuries which occur in patients with underlying osteoporosis and affect 700, 000-1,000,000 in the US annually and 25% of women in their lifetime(2-3). Many of these fractures are treated non-operatively with a short period of bedrest, pain medications, bracing, and therapy. Approximately 30-40% develop disabling pain and deformity (kyphosis) resulting in 150, 000 hospitalizations. Patients with VCF frequently have reduced pulmonary function (FVC), increased risk of mortality compared to aged matched controls, and a lower 5 year survival rate than patients with a hip fracture(4). 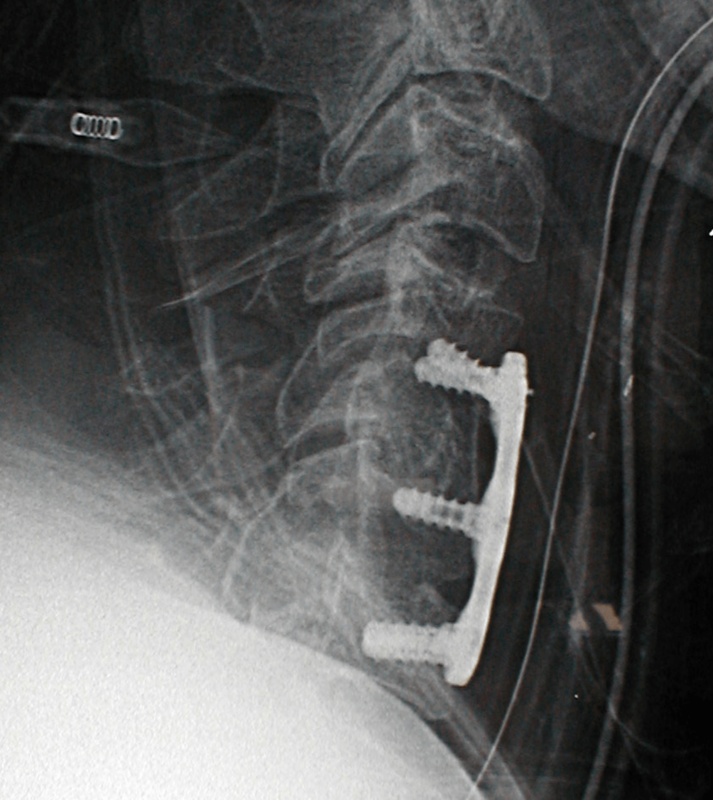 Treatment of symptomatic VCF with vertebral augmentation (vertebroplasty or kyphoplasty) has been shown in various studies to be a cost effective intervention which both decreases pain and improves survival (5-7). Traumatic spine fractures are usually high energy injuries which typically involve young, male patients. Most injuries are the result of high energy falls (35-40%) followed by traffic accidents (20-30%), and low energy falls (20-25%) (8-11). Approximately half involve the thoracolumbar spine (T12-L2) while 20% involve the cervical spine. 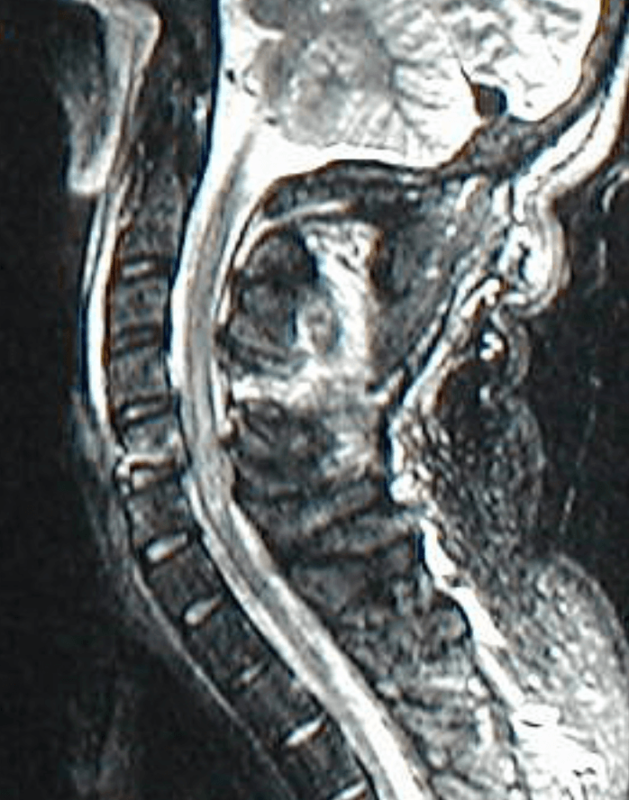 Figure 2: C5 fracture dislocation with spinal cord injury; swelling and increased signal in the spinal cord from the injury resulted in paraplegia. Neurologic injury occurs in 16% overall but in as many as 40% of cervical fractures. There are approximately 12,000 spinal cord injuries each year (9,10) which are associated with a significant mortality rate. Many fractures are treated non-operatively with a 1-3 month period of immobilization and bracing. Unstable fractures and those with neurologic impairment may require surgical treatment, extensive rehabilitative services, and often develop long term disability. There are nearly 800, 000 hospitalizations annually for spine fractures and the majority (97%) are OCFs. Most (58%) involve women and the average age ranged from 62-65 for OCFx . Traumatic fractures are far less frequent (27, 100), predominantly affecting males (69%), and more likely to occur from the ages of 18-44. The majority of compression fractures can be treated with rest, bracing, pain medications and progressive mobilization and are usually healed within 6 weeks. For those patients with persistent pain despite nonoperative treatment or those with severe disabling pain and inability to mobilize or progressive kyphosis kyphoplasty provides excellent pain relief, prevents further collapse, and can be performed in an outpatient or office setting. Figure 3 Compression Fx L1 following kyphoplasty with 50% correction of kyphotic deformity. Stable traumatic fractures can also be successfully treated with immobilization in an appropriate brace. Unstable fractures and those with neurologic compression may require surgical treatment which typically involves stabilization with fusion and instrumentation (PLF, anterior discectomy fusion and instrumentation, ALIF, DLIF) of the involved segments and decompression (laminectomy, ADFI, corpectomy, vertebrectomy) of any compressive neurologic lesions. Figure 4. C5 Fracture dislocation treated with anterior decompression (C5 corpectomy) to decompress the spinal cord and maximize neurologic recovery and stabilization with fibular strut graft and plate and screw fixation to facilitate mobilization and rehabilitation. 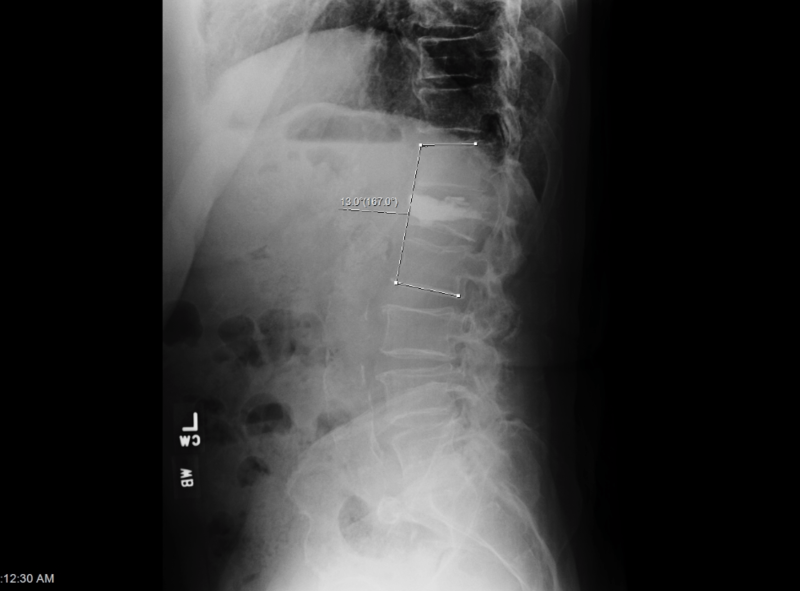 Case Study 10: 59 yo woman with brucellosis infection and progressive kyphosis and myelopathy. Venmans A, Klazen CA, Lohle PNM, et al. Natural history of pain in patients with conservatively treated osteoporotic vertebral compression fractures: Results from Vertos II. AJNR Am J Neuroradiol. 2012 Mar;33(3):519-21. Riggs BL, Melton LJ. The worldwide problem of osteoporosis: in- sights afforded by epidemiology. Bone 1995;5055–5115. Kado DM, Browner WS, Palermo L, Nevitt MC, Genant HK, Cummings SR. Vertebral fractures and mortality in older women: a pro- spective study. Study of Osteoporotic Fractures Research Group. Arch Intern Med 1999;159,1215–1220. Svedbom, A., et al., Balloon kyphoplasty compared to vertebroplasty and nonsurgical management in patients hospitalised with acute osteoporotic vertebral compression fracture: a UK cost-effectiveness analysis. Osteoporos Int, 2012. Garfin SR, Reilley MA. Minimally invasive treatment of osteoporotic vertebral body compression fractures. The Spine Journal, 2002(2): 76-80. Edidin AA, Ong KL, Lau E, Kurtz SM. Mortality risk for operated and nonoperated fracture patients in the medicare population. JBMR, 2011 Jul;26(7):1617-1626. P Leucht, K Fischer, G Muhr, EJ Mueller. Epidemiology of traumatic spine fractures: Injury, 2009 Feb;40(2):166-172. Wang H, Zhang Y Xiang Q, et al. Epidemiology of traumatic spinal fractures: experience from medical university-affiliated hospitals in Chongqing, China 2001-2010. J NS Spine 2012 17:459-468. National Spinal Cord Injury Statistical Center: Spinal Cord injury facts and figures at a glance. http://www.spinalcord.uab.edu. Riggins Rs, Kraus JF: The risk of neurologic damage with fractures of the vertebra. J Trauma 1977;17(2):126-133. Alexandru D, So W. Evaluation and management of vertebral compression fractures. The Permanente Journal. 2012;16(4):46-51.